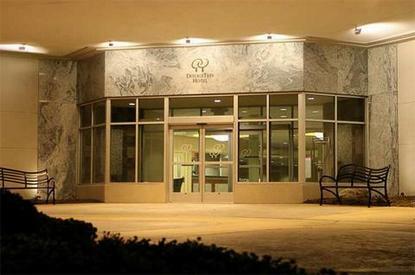 The Doubletree Hotel Holland, located just off U.S. Highway 31 within minutes of beautiful Lake Michigan, offers new, full-service upscale hotel accommodations convenient to major manufacturing centers, I-196, and the Holland business district. Our modern hotel is 35 minutes from Gerald R. Ford International Airport (GRR) in Grand Rapids, Michigan and we're within three miles of many popular western Michigan Dutch attractions, Windmill Island, and downtown Holland shopping.Spacious, contemporary guest rooms embellished with rich earth tones and soothing blues create an environment of classic comfort and modern elegance. Doubletree Holland hotel guests enjoy 27-inch flat screen TVs, microwaves, and refrigerators in all rooms, and our luxurious Sweet Dreams beds. Other in-room conveniences include generous work surfaces, ergonomic desk chairs, wireless high-speed Internet access, and virtual in-room printing services. For recreation, head to our year-round, four-story domed relaxation center featuring an over-size swimming pool, whirlpool spa, and Fitness Center with the latest in cardio and weight training equipment. Dine at the intimate West Coast Grill, open for breakfast, lunch and dinner daily and serving contemporary American fare, including succulent signature entrees. Relax with colleagues and conversation over your favorite beverages in Coaster's Lounge. For your convenience, complimentary wireless HSIA is available throughout the Doubletree Hotel Holland common areas.The Doubletree Hotel Holland provides the perfect environment for local groups or those traveling on business to western Michigan. Located adjacent to Johnson Controls, we're also near major corporations like Tiara Yachts, Haworth, Herman Miller and Graham Packaging. In addition to state-of-the art guestroom amenities, our complimentary Business Center provides everything needed to remain productive while on the road. Over 9,500 square feet of flexible and well-appointed meeting spaces, including two beautiful ballrooms, can accommodate business meetings, seminars, conferences, special occasions and events of up to 850 with ease. Let our experienced banquet staff create a memorable occasion for your wedding reception or corporate extravaganza.The Doubletree Hotel Holland is the premier upscale hotel on Michigan's West Coast, close to Dutch Village, Tulip City, several golf courses, and the beaches, fishing charters, and dunes of Lake Michigan. Whether your next visit to Holland, Michigan is for business, family vacation, or weekend getaway, our friendly and professional hotel staff looks forward to welcoming you with our signature, warm chocolate chip cookie at check-in.